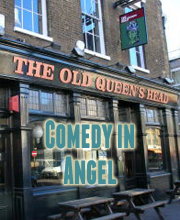 Laugh Out London returns to The Old Queen’s Head in Islington with another excellent bill headlined by the ABANDOMAN! Legendary Improvised hip hop stars are simply one of the best live acts around. 8 Out of 10 Cats Does Countdown, BBC3′s Live at the Edinburgh Fringe Festival.There is nobody quite like them. New material from one of the UK’s finest standups. Telly appearances include Live at the Apollo, QI, The Thick of it & Never Mind The Buzzcocks. Sara has recently had massive success with her first book “Animal”. A remarkable performer who keeps more surrealism and invention hidden in his trouser leg than most comics have in their whole body. Up and coming stand up who is a previous So You Think You’re Funny? Finalist and a runner-up in the Chortle Student Comedy Awards. He was also nominated for Best Debut Show, Dave’s Leicester Comedy Festival 2016. A brilliantly playful comic who make up one half of the critically acclaimed duo Letluce. Last year’s Edinburgh fringe saw her involed in three diffrent shows including her solo sow that saw here dressed as an egg. Charming Australian Bec Hill has established herself as one of the most fun and inventive acts on the circuit. She runs the amazingly fun Pun Run gigs and has been named one of Time Out’s funniest comedians on Twitter.